An email list is one of the most important elements of marketing. An email list is a pre-built advertising platform that’s filled with people who are already familiar with your business and are interested in your products and services. Building your email list is crucial for business growth. 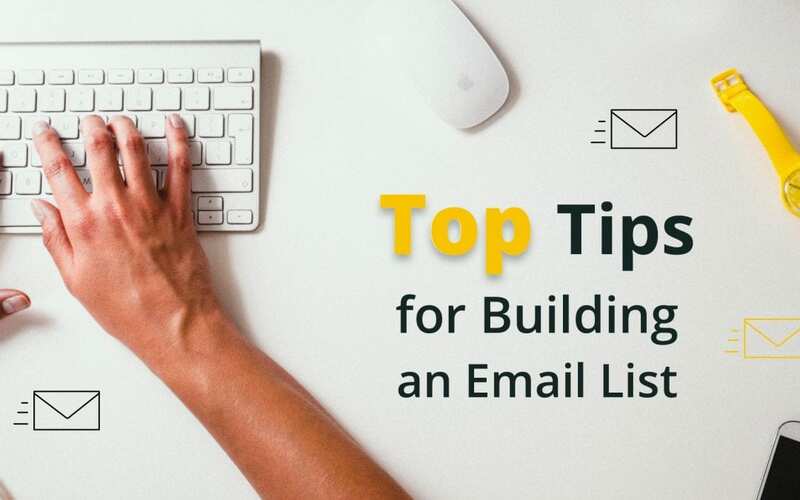 In this article, we’ll discuss the top 10 tips for building your email list. When they see high-quality content, such as tips, tutorials, lists, etc., on a regular schedule, they want to be reminded to come back for more. If your quality and schedule are consistent, they’ll be expecting your newsletter and will be more likely to open and engage with it. Hosting a giveaway gives you an opportunity to help give something amazing to your audience. It can be a physical or digital product. Give away something amazing that’s relevant to your business and audience. The more substantial the product is the more likely the content will be shared. The above example is from the Divi Space Black Friday giveaway. You could give away your own products, purchase products to give away, or you could collaborate with other companies to give away their products on your platform. This encourages the companies to share the information about the giveaway with their audience while sending the traffic to your website. Be sure to collaborate with brands and influencers that have similar values to your brand and whose audience shares the same interests as yours. There are several WordPress plugins and online services with free and premium options that help your giveaway go viral. They provide tools that would require them to sign up to your email list as an entry, follow you on social media, and it could encourage them to share your content in order to get additional entries. Give them an incentive to sign up. Giving a free product is probably the most popular method of getting someone to sign up to your email list. All of your offers should be clear and easy to understand. Take away their fear of subscribing. I recommend creating several free products and allowing subscribers to download all of them. This way there’s bound to be something of interest to them in case they’re not interested in the one big download. This can be a PDF, an e-book, guides, lists of tips, access to a video, access to a page, access to a course, access to online tools, free layouts, plugins, images, icons, fonts, etc. The possibilities are endless. Just make sure it’s something of value to the reader. If you offer free products often, they are more likely to stay signed up because they would have to opt-in to get the download. Even a simple course can be a high-value freebie. This also lets you send them an email as a series over a period of time, and each email can contain a call to action. If they’re involved with the course, they’ll open each email and see the CTA. This also helps build your credibility and trust with your audience. 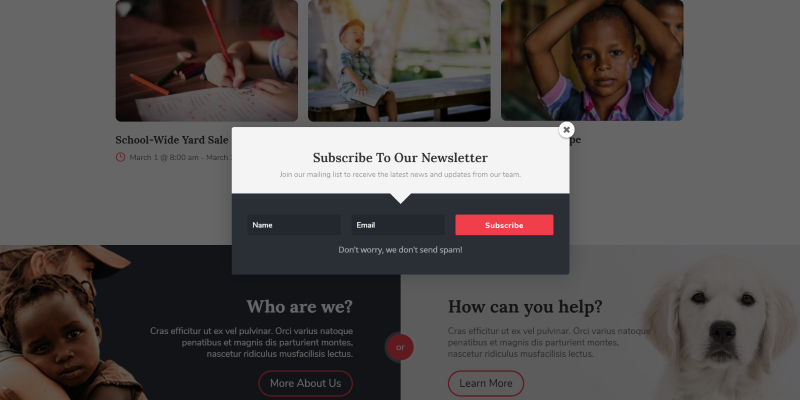 Just placing a sign-up form in your sidebar isn’t enough to get visitors to subscribe. Sidebars are too easy to ignore, and often they’re moved to the bottom of the page when visitors read your content on mobile devices. Do place them in your sidebars and footers, but declutter those areas so your sign-up form is easy to see. The example above is from Divi Business Pro. Design your form so that it looks like it’s part of your website and not just an ad that readers are trained to ignore. Rather than just placing the form in the sidebar, add the form to your content, such as within the content or at the end of your content as a call to action. The example above is from Jasmine. Include it on your About Us page as well as your homepage. The About Us page is where they’re looking for more information about you and your brand, so they’re more likely to sign up out of interest in the company. A lot of times, we become blind to email forms- no matter how visible your email form is. We know it’s something to ignore. Even if readers see it, and they intend to sign up before leaving, it’s easy to forget. Email popups are a great alternative because they work. Creating a popup that shows after they’ve reached a certain scroll-point, spent so many seconds on the site, or move their mouse toward the address bar can be all the reminder they need of your email list. Make sure the popup is stylish but simple and easy to understand. Make it clear what you want them to do and what they’ll get for it. Make sure they understand that they can unsubscribe at any time. Be careful with popups though. Too many popups can be annoying. Keep them small. Be sure to use a cookie so they don’t have to see the popup if they’ve already subscribed. The example above is from Divi Nonprofit. If you sell products, either physical or digital, offer subscribers a coupon for subscribing. This can be part of the call to action for the product description or article. Saving them money is practically a guarantee they’ll subscribe if they already plan on purchasing, it could be the boost they need if they’re on the fence. Not only do they become a subscriber, but they also become a customer. 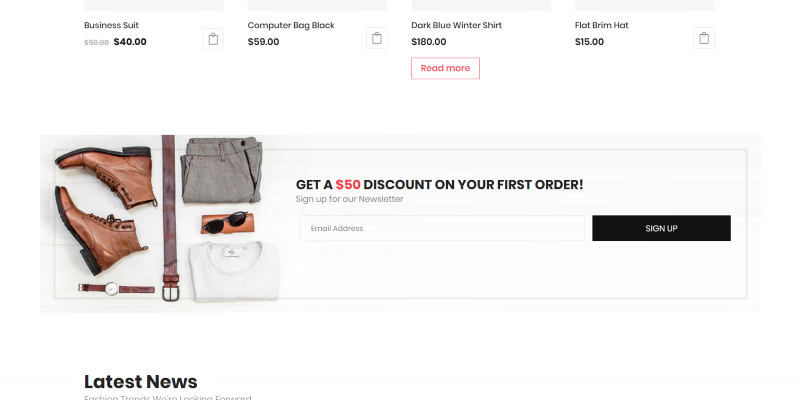 You could also include offers that only email subscribers receive such as an add-on to a product, an exclusive product, early access to products, special discounts, access to certain pages within your website, etc. Subscribers are more likely to stay subscribed if you provide exclusive offers. The example above is from Divi eCommerce. This could be content that isn’t published anywhere else. The only way anyone can see it is through your email. This could be articles, lists, tips, tutorials, etc. Just like exclusive offers, subscribers are more likely to stay subscribed if you provide exclusive content. You can create a group on Facebook, LinkedIn, a membership area on your own website, or many other options, and make signing up to your newsletter part of the requirements for joining the group. Add sharing buttons and include a brief message to encourage subscribers to share your newsletter content. Also, be sure to create content they will want to share. People love to share things they find value in. Building an email list is a crucial part of your marketing efforts. Building the list isn’t fast and it doesn’t happen by accident. It takes strategic planning and investment of time and money but building an email list that you can market to can get you an excellent return on your investment. Fortunately, there are a lot of things you can do to help build that list. These top 10 tips for building your email list will get you pointed in the right direction. They can be summed up in three easy-to-remember steps: target your visitors, give them an incentive to subscribe, and give them an incentive to share your newsletter with others. Do you have tips for building an email list? Share them in the comments.